The Place: A beer hall with a holiday season ski lodge theme. The Time: Tuesday December 11, 5:45pm. I’m going to the opening of Clueless the Musical at The New Group, and it’s that time of year when the city is ripe with holiday pop-up bars, so I thought I’d hunker down at one before the show. I love a good holiday pop-up and the one at Treadwell Park West is literally the closest one to the theater. In this cold weather, I wanna be festive but also stay warm, so if I can get a hot cocktail and do as little walking as possible, I’m a happy camper. 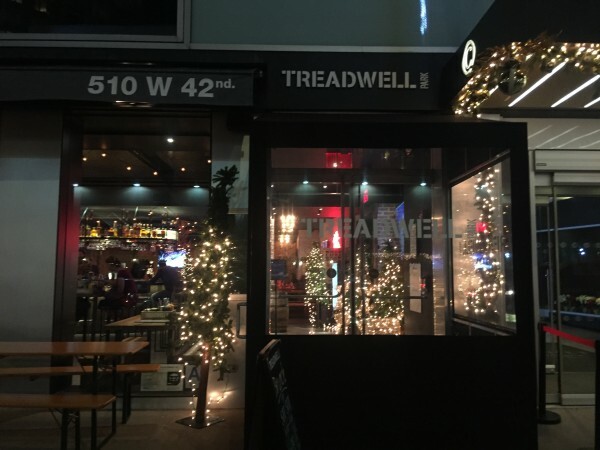 The Vibe: I’d never heard of this place until I googled “best holiday pop-up bars” but apparently there are three Treadwell Parks in Manhattan. One in Battery Park, one on the east side and this one, in Midtown West, which everyone knows is my least favorite neighborhood except for Murray Hill. I walk in and I’m surprised by how spacious it is, but I’m a little disappointed. As far as holiday decorating goes, it feels like they just wrapped a bunch of Christmas lights around a sports bar. I was promised a ski lodge, called Après Ski in fact, but besides covering the long beer-hall table benches in faux fur and putting the staff in flannel, I’m not getting much of a ski lodge vibe. Then again, I’ve never been to a ski lodge so what do I know. Oh, there are a pair of decorative skis in a corner? Idk. I’m a sucker for anything with a theme, but it feels like these guys should’ve taken a trip to Party City. (Fun fact about me: I love Party City.) As for the bar underneath the winter wonderland attempt, it feels like a regular beer hall sports bar combo. Long wooden tables, brick walls, air hockey, board games, pinball machines, a photo booth, many very large TVs that compete with the Christmas lights. It’s clean and relatively empty, which does make it more pleasant than your run of the mill Midtown bar. Because it’s so big, it’s a good place for large groups of friends or co-workers, predominantly the clientele in here right now. There are also a decent number of (male) regulars or after-work regulars, but they are far enough away from where I am. The Bartender: Tim, a stoic yet amicable guy who looks like he wears flannel regularly. The Drank: There is a small “Après Ski” menu of drinks and food. Because I’m committed to the theme perhaps more than the bar is, I pick the spiked hot chocolate. 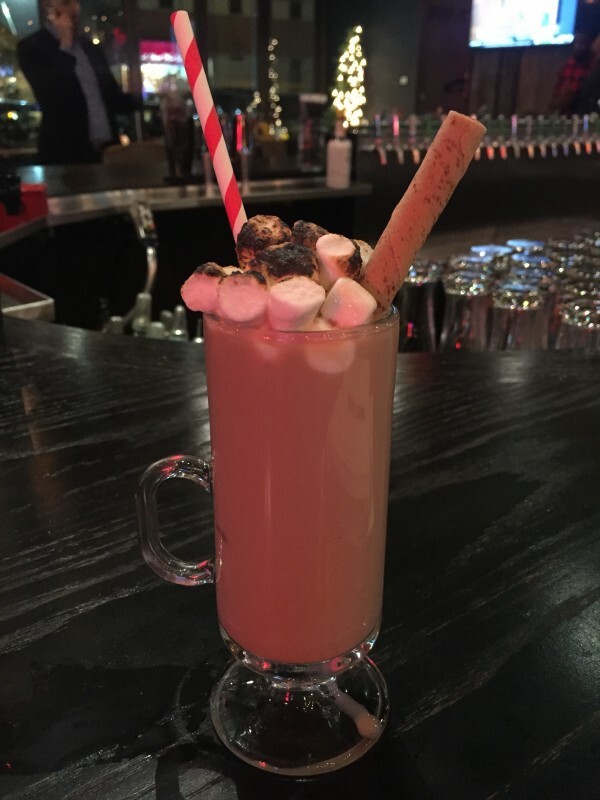 Rum, maraschino liqueur, and uh, hot chocolate, topped with an enormous mountain of charred marshmallows. It’s very good, if on the sweeter side, but I did order a hot chocolate so it’s exactly what I expect. I get the smell of burnt marshmallow every time I take a sip, which is delightful. Ok, ok, I feel a bit more like I’m in a ski lodge now. Was I Hit On? Nah, the only person who talks to me is Tim and it’s to introduce himself and ask me how I like my hot chocolate. No one else is sitting at the bar except for me and another man who leaves me alone. At one point, a guy comes up and wants to talk tequila. When Tim suggests Casamigos, the guy says he already loves it and wants to try something new. I can’t tell you what he settles on because he walks away mid-conversation to sit back down at his table. Tim is unfazed by this, though I find it rude. But the guy doesn’t even try to start a convo with me after he sees I’m drinking a hot chocolate so whatever. Should You Drink Here Alone? Sure why not. It’s always good to have jerk-free zones in this neighborhood and from what I can tell, Treadwell Park West is big enough to avoid them if they happen to appear. It’s a fine spot to grab a drink before the theater, even if they’re slacking a little on the holiday spirit.